I know absolutely nothing about marketing, except the fact those who engage in marketing are creative people. That, and knowing it’s a booming career that welcomes the opportunity to work from home. 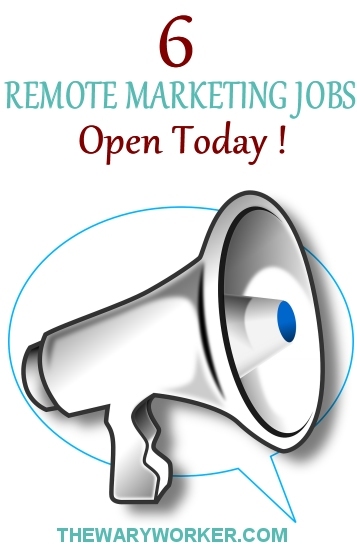 Over the last few days I have come across quite a few remote marketing jobs. And because we here at The Wary Worker place a lot of emphasis on job openings that you can apply for today, I am super happy to present my findings. Which happens to be 6 current openings in the marketing field with 4 different companies. Hubstaff allows their employees to work from anywhere, bringing their projects from inception to completion. Today, they have 3 marketing jobs that let you work *wherever*; openings that I’m sure you’ll want to jump onto right away. What I really like about this company is the fact they often have marketing jobs that come up. Marketing Generalist. The required skills include a working knowledge of HTML, SEO/SEM experience, and knowledge of Facebook and Google advertising. Your main responsibilities will be to work with partners to get Hubstaff listed newsletters, directories, etc. You will also write web, email, and blog copy while creating walkthrough videos and performing influencer outreach. Content Marketer and Writer. If you understand content marketing and can write well, this is a job for you. You’ll tap into your awesome story-telling abilities and write amazing blog posts for the Hubstaff blog while sprinkling in some of your keyword research and WordPress editing skills. Growth Marketer to work as a team player uncovering working strategies. Hubstaff expects you have experience with an Saas or e-commerce company as well as a deep understanding of analytics and the ability to write well for web and email. If any one of these jobs is a good fit for you, you can apply here. We’re a tiny bootstrapped company, so you should be a self-starter who loves to get things done and embraces responsibility. You won’t just be a cog in the wheel. Your impact will be felt inside and outside the company. You’ll help shape our brand, our culture, and our product. You’ll work directly with the founder and have full autonomy to do your very best work. So if you have excellent writing skills and can create content on a daily basis with an analytical mindset, this might be the perfect job for you. It will be your responsibility to create a working content marketing strategy that increases company awareness. Some of your day-to-day responsibilities will be to create content, manage the production calendar, and work with influencers. The salary will be $50,000 to $70,000 and includes a slew of benefits. You can apply for this Memberful job here. University of North Texas needs a remote Social Media Assistant to join the Health Science Center Library Department. This is a part-time position, working 2 hours a day (10 hours a week) researching and creating daily social media content featuring regional programs communities and agencies. You will also track analytics, research audience behavior and stay on top of social media trends. As far as education, all you really need is a High School diploma or GED and 2 years of related experience. That said, they prefer a background or strong interest in health sciences, basic knowledge in HTML and a Bachelor’s degree. And did I mention the pay is $14.00 an hour ? Apply for this job here. So, if you have a Bechelor’s degree in marketing, communications or a related field, 2-3 years of client management experience, and clear communication skills, you can apply here. Do any of these jobs interest you ? Craft your resume, fill in the online application and get your new job. If you get one of these jobs, please feel free to leave a comment below.